Prolonged severe hypoglycemia can cause permanent brain damage, similar to anoxic brain injury. Hypoglycemia is most dangerous among intubated and sedated patients, because mental status changes won't be immediately evident. Overall, hypoglycemia is far more dangerous than hyperglycemia. When dosing insulin in an acute care setting, it's always safer to leave the patient in a mildly hyperglycemic range. 1) How low is the glucose? 2) Is the patient symptomatic? Absence of symptoms is certainly reassuring. Unfortunately, ICU patients who are intubated/sedated may be impossible to evaluate. Front-line test due to speed. Can be artificially elevated by maltose (in patients receiving IVIG or peritoneal dialysate). Fingerstick glucose may be inaccurate in patients with poor perfusion. It may be ideal to obtain blood from an arterial or venous catheter, to avoid perfusion problems. 1) Send blood to lab for glucose level. 2) If patient is symptomatic or sedated, give IV dextrose immediately (without waiting for confirmatory lab results). Gold-standard, should be used to double-check fingerstick results in questionable cases. As noted above, treatment should not be delayed while awaiting a confirmatory laboratory result, unless the patient is awake and mentating normally without symptoms. Laboratory glucose measurement can be low if blood sits around for a long time before processing, or if there is severe leukocytosis. Diabetes medications not listed above (e.g SGLT-2 inhibitors, metformin). These usually don't cause hypoglycemia on their own, but may synergize with other risk factors. Insulinoma or various malignancies (e.g. mesenchymal tumors, hematologic malignancies). Most often insulin or sulfonylurea misuse. Review new medications or dose changes (lots of medications cause hypoglycemia, look up the patient's medications in a pharmacopia to check). Changes in renal or hepatic function may cause drug accumulation. Adequacy of oral intake? Recent alcohol binge? Other features may suggest sepsis, chronic adrenal insufficiency, or hepatic failure. Insulin level > 3 microunits/ml (21 pM) in context of hypoglycemia suggests pathologically excessive insulin levels. This may reflect either endogenous insulin synthesis or exogenous insulin administration. Unfortunately, some synthetic forms of insulin may not be detected by the assay (e.g. glargine). Measures only endogenous insulin production, allowing differentiation between endogenous over-production of insulin versus exogenous insulin administration. C-peptide level >0.2 nM (0.6 ng/ml) in the context of hypoglycemia suggests pathologically elevated insulin secretion by the pancreas. Elevated levels (>2.7 mM) argue against a hyperinsulinemic state (because insulin suppresses ketone production). Thus, elevated levels would suggest entities such as starvation, alcoholic ketoacidosis, or sepsis. Generally a stressed, hypoglycemic patient should have somewhat elevated levels of cortisol. Low levels should alert to the possibility of adrenal insufficiency. When in doubt, an ACTH stimulation test should be performed to clarify. Below is a general strategy for severe hypoglycemia with threatened brain injury. Glucose should be monitored carefully throughout (at least q1hr or more frequently). Treatments should be titrated to achieve a safe glucose level (e.g. 100-200 mg/dL or 5.6-11.2 mM). Pushing the glucose too high can be counterproductive, as this can stimulate endogenous insulin release leading to rebound hypoglycemia. Continue working through the algorithm until the patient's glucose is stabilized. The traditional treatment has been 50 ml of D50W (one ampule of D50W). This is readily available and easy to administer. D10W is another option (~100-200 ml usually; may be pushed in several 50-ml boluses). Disadvantage: D10W takes slightly longer to give, so it may be less useful for patients with profound symptoms who need immediate treatment (e.g. seizure, coma). If the patient doesn't have IV access, then place an IV or intraosseous line immediately. If the patient wakes up and is able to tolerate oral nutrition, this is the most efficient way to provide carbohydrate. A Snickers bar contains 215 Calories. This is the same number of calories as 1.25 liters of D5W. A pint of Ben & Jerry's ice cream contains ~1,100 calories. That's equal to 6.5 liters of D5W! Calorically dense foods with a high carbohydrate content are best. Ice cream or chocolate are good choices. For intubated patients with enteral access, tube feedings should be given. 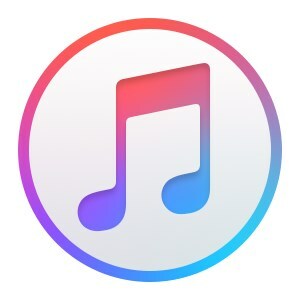 May be given as D5W or D10W. D5W might be slightly better for the peripheral veins, but either can be given peripherally. 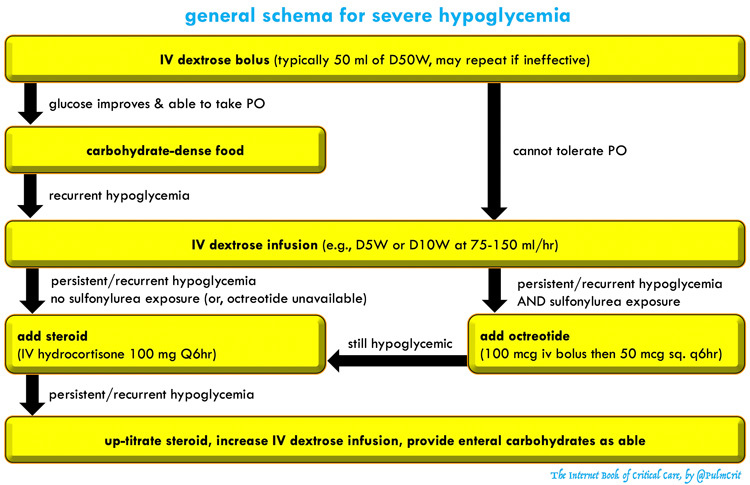 Rate depends on severity of hypoglycemia. A typical rate might be ~150 ml/hr D5W, or 75 ml/hr D10W.5 Titrate to effect, based on frequent glucose measurement. If the patient already has central access, you can give D20W or D50W centrally. However, placement of a central line for the sole purpose of treating hypoglycemia is generally unnecessary. 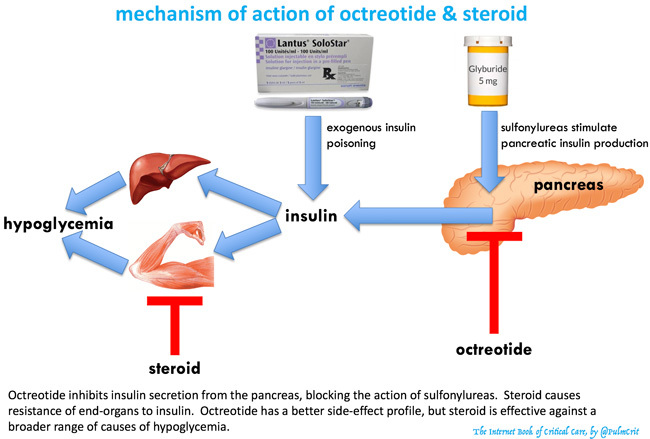 Steroid induces a state of insulin-resistance. This ought to work regardless of the cause of hypoglycemia. However, steroid is particularly effective in patients with adrenal insufficiency or insulin overdose. Any steroid will work, but IV hydrocortisone is preferred due to its rapid onset and relatively short duration of action (8-12 hours), which allows for titration. 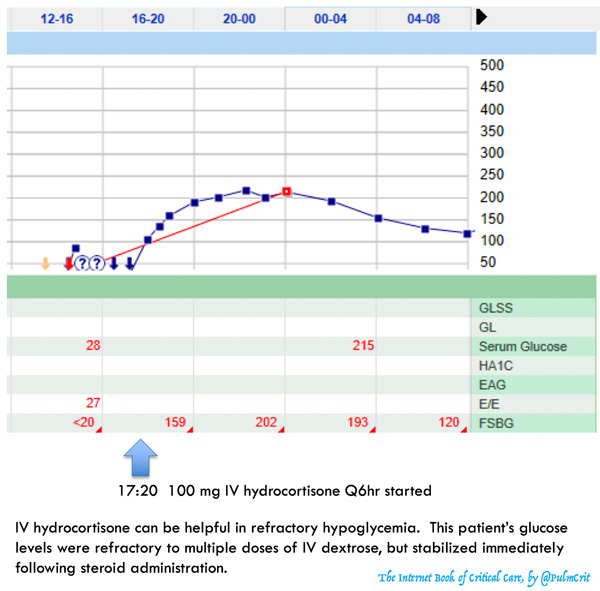 Start with 100 mg IV hydrocortisone Q6hr. Titrate based on glucose level. Maybe might has a role in non-sulphonyulrea hypoglycemia, to prevent rebound hypoglycemia (inhibits endogenous insulin release). However, evidence supporting this is extremely weak. Rebound hypoglycemia can occur within 24 hours of stopping the octreotide, so patients should be monitored during this period. If hypoglycemia is mild and patient is able to take PO intake, provide oral carbohydrate (e.g. juice). For intubated patients with enteral access, this may be provided via orogastric tube. Avoid peripheral D50W if you don't need it, because over time repeated doses can cause sclerosis of peripheral veins. To prevent recurrence, consider providing additional food that contains complex carbohydrates. Upon admission to the ICU discontinue any oral hypoglycemic medications. Hyperglycemia should be controlled with insulin therapy only. Don't try to achieve tight glycemic control. A glucose target of <220 mg/dL (<11.1 mM) is fine for most patients. Patients with diabetes and elevated hemoglobin A1C >7 may do better if their glucose is allowed to drift higher (up to ~250 mg/dL)(13.9 mM). When in doubt, dose insulin conservatively. Hyperglycemia is less dangerous than hypoglycemia. Consider reducing the insulin dose if the patient becomes NPO, or if steroid doses are decreased. Insulin dosing can be tricky. Among all medications, insulin is one of the most prone to serious dosing errors. When in doubt, ask for help from your unit pharmacist or endocrinologist. Patients with cirrhosis or acute hepatic failure tend to develop hypoglycemia, so monitor their glucose levels and avoid giving them insulin. Some patients with severe hepatic failure will require a continuous dextrose infusion to avoid hypoglycemia. To keep this page small and fast, questions & discussion about this post can be found on another page here. Symptomatic hypoglycemia is an emergency, with a risk of causing permanent brain damage. When in doubt, it's always better to err on the side of providing immediate treatment (if you're wrong and the patient gets slightly hyperglycemic, that's OK). Patients with any sort of neurologic alteration (e.g. confusion, seizure, coma) should always have a STAT fingerstick glucose to exclude hypoglycemia. After you treat hypoglycemia, follow the patient's glucose carefully. Hypoglycemia frequently recurs. For example, insulin or sulfonylurea overdoses will out-last the glucose you give to the patient. The cause is usually a medication. Before you start hunting for an insulinoma, double-check the medication list. Every article on hypoglycemia has a different list of drugs. The evidence basis for many of these drugs is questionable. In practice, scrutinize your patient’s medication list and when in doubt query pubmed and/or electronic pharmacopias. This list isn’t exhaustive. . The traditional approach is to give 1 mg of glucagon intramuscularly as a temporizing measure while getting IV access. This doesn’t seem like a great idea for a few reasons. First, glucagon may not work if the patient’s liver glycogen stores are depleted. Second, glucagon can stimulate vomiting, which may be particularly dangerous if the patient has altered mental status and cannot protect their airway. Third, even if the glucagon doesn’t cause vomiting, it may cause nausea which impairs the ability to feed the patient later on (see treatment step #3 above). Fourth, it even if glucagon does work it will take 10-15 minutes to work, which seems like a fairly long delay for a patient with severe CNS symptoms from hypoglycemia.